Mike was very highly recommended to us by a friend who is aware of his stellar reputation. We were blessed to have him as our contractor for our major addition and renovation. The addition blends seamlessly into the original part of the house. Our 75 year old home looks brand new yet retains its character and charm. Mike has a strong construction background and is a graduate engineer. His attention to detail is second to none. His suggestions were always important and an improvement to work being done. Everywhere we look there is a special detail based on Mike’s input. He was supportive and patient throughout, working very closely with us and the trades, keeping the job on track. Mike was always quick to deal with and provide solutions for all the challenges that arise during construction. He also has quickly dealt with any challenges that have arisen now that we are back home. Mike is always prompt in responding to texts, emails and calls. Always available with a smile. We would not hesitate to work with Mike again. After some research and interviews, we decided to use Ionia Renovations for our home renovation. Our experience working with Michael was an absolute pleasure from start to finish. He was very knowledgeable about what the house needed, thorough, and very responsive. If we had any questions or problems, he always answered patiently and suggested solutions when and as needed so that we could make an informed decision on what would work best for us. We were also very impressed with the quality of our contract manager Andre's work and the knowledge he brought. Michael and Andre were very professional, efficient and attentive to all of our questions and we learned a lot from them. We have no hesitation in recommending Ionia Renovations to others and we look forward to future projects. Thank you for the review. It was a pleasure working with you and your family in transforming your home. 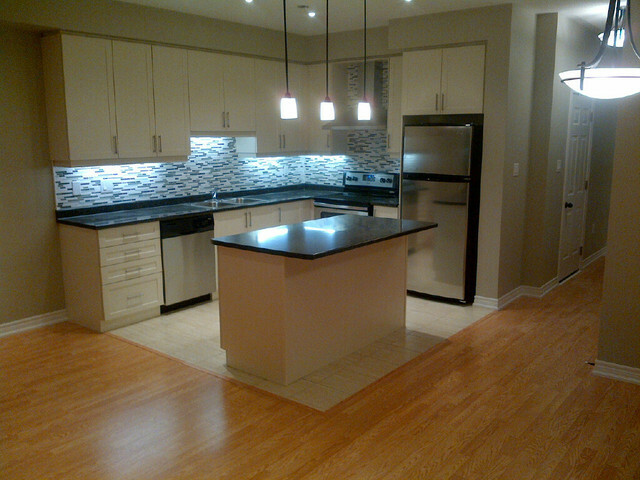 The end result is beautiful and the open concept provided the best use of the available space. I wish you and your family decades of enjoyment in your newly transformed space. We were very happy with the work of Mike and his team and we would not hesitate to use him again or to refer him to our friends and family. Mike's background as an engineer was very helpful when planning for the removal of a structural wall between our kitchen and dining room. We lived in the home while the renovation was being completed and Mike took whatever measures he could to minimize the disruption to our daily lives. He was also patient and flexible with the changes and additions that we made to to our original renovation plans as the construction progressed. Mike did not ask for a large deposit up front, unlike some of the other contractors that we interviewed prior to starting our renovation, and he was fair and up front with his pricing throughout the duration of the project. Since the renovation was completed Mike has made himself available to us to deal with any minor issues that have arisen and to answer any questions that we have about future renovation plans. 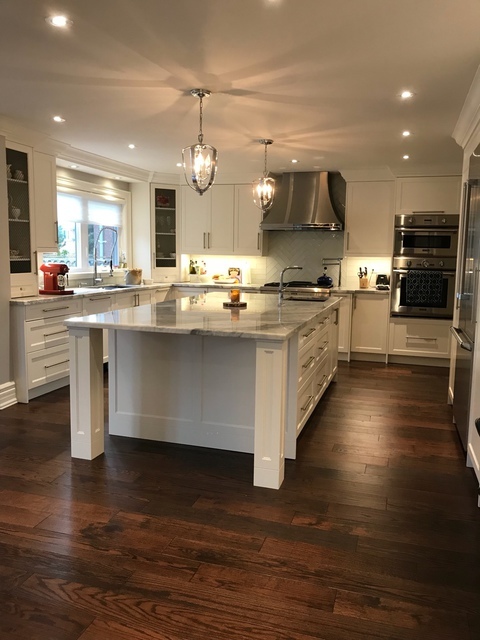 Mike and his team undertook an extensive renovation of our home over an eight month period. Mike completed a previous job on a rental property and we knew that he was the right person for our 'forever home'. As expected, he effectively navigated the complex process around permits, trades and timelines to ensure that we had a final product that we are very happy with. Throughout the process, Mike was in constant communication and we really appreciated his approach to keeping us up to date on progress and upcoming decisions on finishes etc. Mike often went 'above and beyond' providing advice and input at just the right time. For example, he made suggestions on better placement of the kitchen for an open plan main floor and suggested that size of the bathroom in the plans was too big. We made both adjustments based on Mike's suggestions and are very glad that we did. 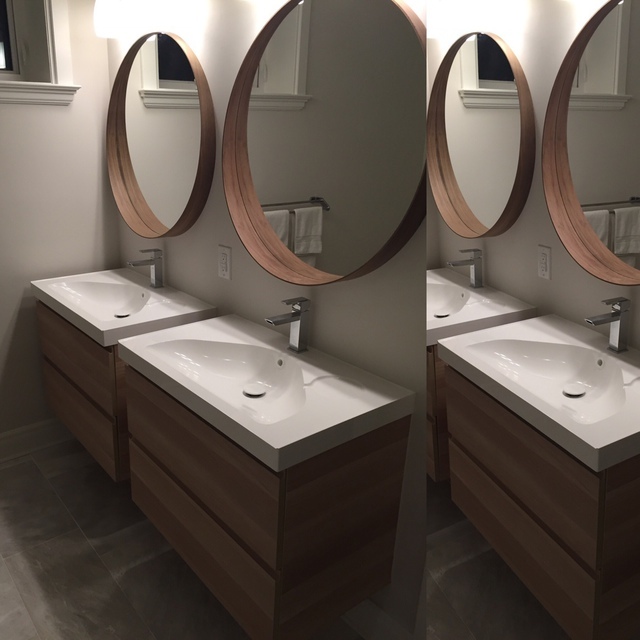 We continue to be impressed with his work and after this renovation, his team went on to renovate bathrooms and a full rental apartment for us. Once again, his team was very professional and completed the work on time and on budget. Despite being very busy moving into our new home, jobs and life with young kids, he made the renovation as easy as possible for us. We will be calling Mike and his team for future projects and would recommend Ionia fully and without hesitation. 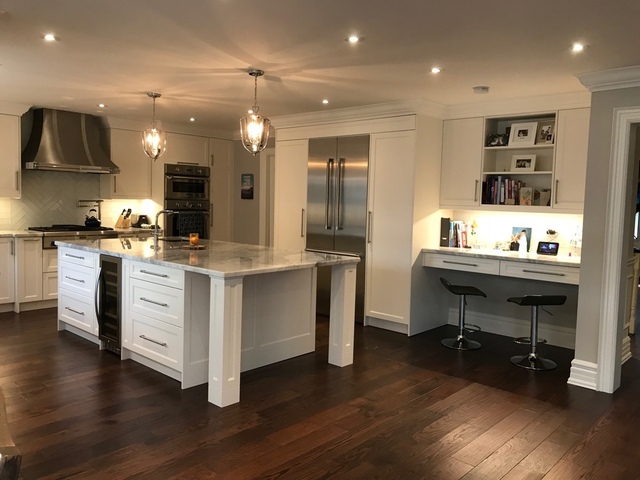 We did a fairly large renovation with Ionia – finishing the basement with a second suite, and complete demo/reconfig of our third floor including adding a master ensuite and second bedroom. Mike and his team did a wonderful job and were great to work with throughout the process. Mike is always responsive, every time I called he either answered or called back immediately, which has not always been the case with other contractors we’ve worked with – he was also onsite personally almost every day and did regular walkthroughs showing progress and checking that everything was to our satisfaction. He listened to our input and was really responsive and supportive when we had suggestions or wanted to make changes. We were picky about materials, in some cases having to wait for special orders, but Mike was able to make adjustments that still brought us to end of project on the original scheduled date. In terms of budget, it was clearly defined from the beginning and the only overages were due to our own choices (adding items not in original scope, etc). Everything was transparent and communicated clearly. We weren’t sure of the best layout for the basement, and Mike came up with ideas, then spent time making computer plans of the options so we could make the best decision. We lived in the house throughout the renovation, and the team and all subtrades were always conscientious and tried to minimize the disruption to us to the best of their ability. We’re really happy with the finished product and would not hesitate to recommend Ionia to family and friends. Thanks Mike and team! Hi Todd, Thank you for your kind review. I am very happy with how your project turned out. There are always so many details and decisions to be made that it can sometimes be overwhelming. We worked very well as a client/contractor team to piece everything just perfectly and satisfy every need you guys desired. Efficient and effective communication is critical in managing any project successfully. I am very thankful that you put your trust in me and allowed me to deliver a high quality product to suit your every need. I look forward to working with you guys again. To your continued success, Mike. My family and I recently moved to a 100 year-old home in East York that needed some significant work. We had plans to renovate our kitchen, bathroom and to remove a wall, and we were nervous about the process, as we assumed it would take a significant amount of time. We had also heard horror stories about contractors, so all in all we were a bit apprehensive. I contacted Mike on the recommendation of a friend, and he and his team were nothing short of amazing. 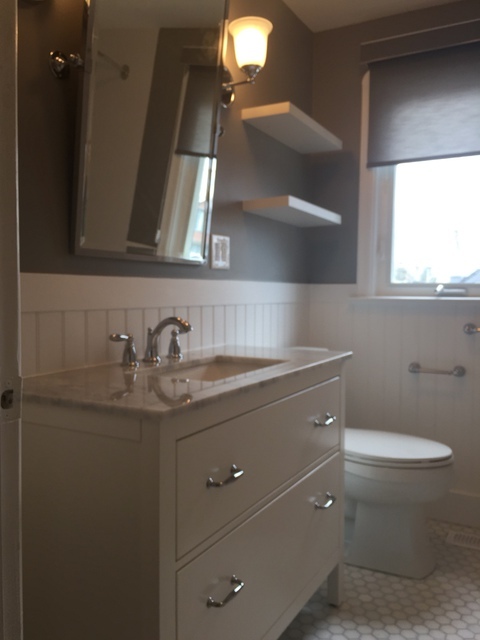 Our reno was pretty extensive (we completely gutted our kitchen, restructured and expanded our main bathroom and removed a structural wall), and Mike and his team completed it in only six weeks, with incredible workmanship. Mike was very reliable, proactive and responsive. He kept me updated every step of the way and was very helpful as we navigated all of the finer details of the reno (like picking finishes, etc). He was also able to find us cost savings, which we used for some extra work in the house like painting and additional lighting. The end result is spectacular - he has truly given us a dream home. I wouldn't hesitate to recommend him to anyone, and in fact I look forward to working with him again when we look to renovate other areas of the house. Thank you Mike! Mike and Ionia Renovations helped manage a project around long business hours. He accommodated a tricky schedule, kept it on time, on cost and deftly managed last-minute changes on my part. We weren't the only ones happy with the work. Many customers passing thru loved the changes and requested contact information for Ionia Renovations. The extra hours Mike and company put in didn't go unnoticed - there were no delays. If time constraints are crucial to your project, don't hesitate to call Mike. Hi Jonothan, Thank you for the review. Your project was unique as we kept the work activities outside business hours to minimize disruption. It was a pleasure working with you and there was a real sense of accomplishment given the timing constraints. Thank you again for your repeat business. Until next time. Mike. We contacted three different companies to quote our basement renovation. While all the quotes were competitive, we got the best feeling about Mike and his team. Mike, Andre, and all of the subcontractors were professional and incredibly nice. We planned a layout for our small and unfinished basement which included a laundry room, family room, bathroom, and bedroom and they were able to build it beyond our expectations. It is now incredibly functional and we are able to utilize every bit of space. Mike had no problem coming back after the project was done to do some touch ups. Followup was very important to him and he wanted to ensure that everything was perfect. They were able to work based on our timeline and work with our budget. I was really impressed with how he was able to see our vision and create something even beyond what we imagined. 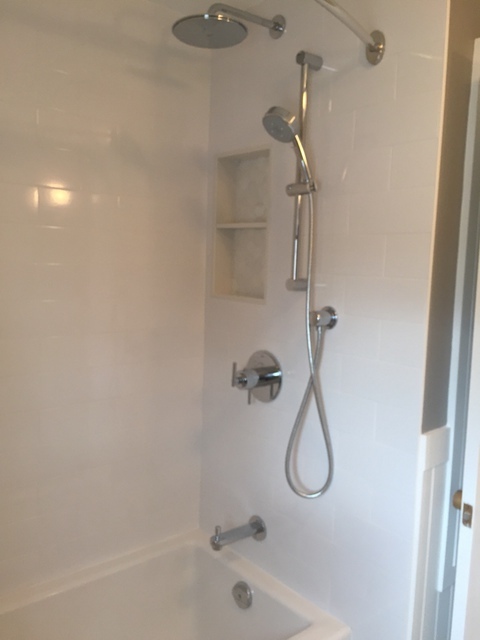 We would highly recommend using Ionia Renovations and will use Mike and his team in the future if we have any other projects in need of a renovation. I hired Ionia based on two of my friends recommendation to manage and provide a complete home renovations project. The reno project was extensive and took about 5 months to complete. Mike has showed a professional level of commitment to the project deadline. Mike and his team were responsible for the compete project. Ionia did most of the house reno, but also managed other contractors. Reno projects can be hectic but Mike and his team were pleasant to deal with and have delivered a fantastic job at the end.